Ah, the dawn of a new year. For many, that means a renewed vigor for temperance, or at least moderation. Others see a long road to hoe until spring, so we look to vigor in our liquor cabinets. If your 20s have come and long gone, you probably picked up a couple of bottles of sparkling wine (or Champagne, go you) for New Year's Eve and got through approximately one half of one of them. Not to worry, staying up for Central Standard Time midnight is perfectly acceptable these days. But don't make the mistake of stashing your leftover bubbly at the back of your cabinet. Sparkling wine is a year-round drink, not just for special occasions, and it's begging to be dressed up. It's become a staple of my bar and I earn a writer's salary. Now, by the time you're reading this, the half bottle of Champagne you opened on New Year's Eve is dead flat. If you resolved to reduce waste in 2018, you could follow Diana Vreeland's (dubious) suggestion to wash your child's hair with the leftover Champagne, or poach fish in it, per Zsa Zsa Gabor (or so the legend goes). If you bought expensive Champagne, I hope you finished it. It's worth the morning fuzziness and we can't all be Zsa Zsa. If you're reeling from that old acquaintance that won't be forgot, the hangover, a friend swears by his own breakfast cocktail called the Bert & Ernie: Champagne and Pedialyte. I guess you have to get back on the horse one way or another. January's a perfect month to experiment with Champagne. It's endlessly adaptable as the base of a drink or a float, and it welcomes fruits, bitters, liqueurs, shrubs, spirits and more. Mix it with raspberry lambic or throw a tangerine wedge in a glass. If you're in the mood to go out, Richard's Goat Tavern has a nice menu of Champagne cocktails. Most bars are offering at least one Champagne based drink lately. A personal favorite is about as simple as it gets. I forget exactly where and when it came into my life, but I suspect it was during a few Cava-swamped weeks in Spain years ago. It's a tasty, cheap way to dress up any sparkling wine and goes over well with guests. Champagne flutes make this drink look impressively effervescent. Put a sugar cube in the bottom of a champagne flute. Soak the cube generously with angostura bitters. Slowly fill the glass with sparkling wine. Adapted from Shake by Eric Prum and Josh Williams. One of winter's delights is fresh, delicious citrus. Lemons, tangerines, oranges and grapefruits. This simple recipe combines fresh squeezed ruby red grapefruit with just the right earthiness of sage. Pick your favorite gin (I've been enjoying Blue Lake's own Jewell lately), and be careful — these go down easy and can sneak up on you. For this recipe, you'll need a shaker, ice and coupe glasses. Simple syrup is 1-to-1 sugar and water brought to a simmer and stirred until the sugar dissolves. Let it cool before adding to a drink. Crush 2 sage leaves and the grapefruit zest and add to the shaker. 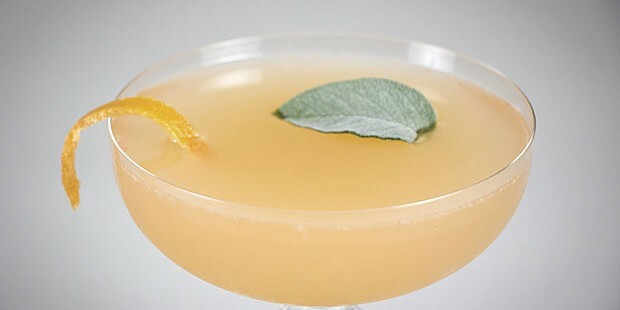 Add the gin, grapefruit juice and simple syrup. Add the ice and shake. 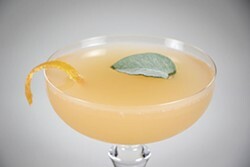 Strain into chilled coupes, top with bubbly.